Take an audio journey beyond Pluto with this enhanced edition of the Derelict: Tomb audiobook. This Shadowpublications.com exclusive version includes music and transitions that are not available from Audible, Amazon, iTunes, and etc. This version is just for you. Download it. Listen. And experience the book the way it was meant to be. Their mission was to recover an ancient derelict from the farthest edge of the Sol system. What they’ve found could spell the end of humanity. Trapped on the Mira, Corporal Kalimura must lead her squad of injured marines to safety. But, aboard the derelict, every shadow is a possible threat, and around every corner lurks another hazard. Without life support or gravity, and only their suit lights to see by, they must explore the ancient wreck to find a way to communicate with their ship and escape their hellish prison. The remaining crew aboard S&R Black struggle to tow Mira out of the path of an incoming Kuiper Belt Object only to realize that the non-sentient hazard is the least of their worries. 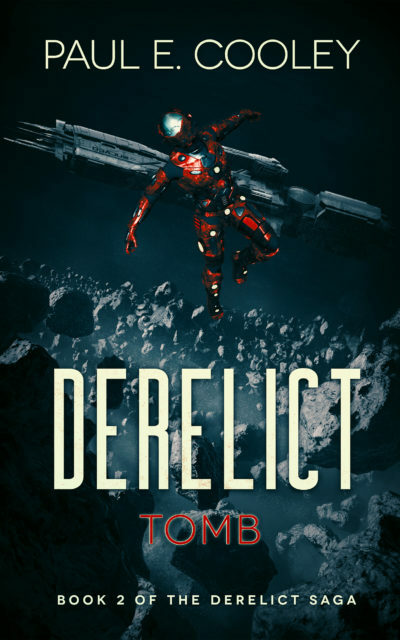 Derelict: Tomb, book 2 of the Derelict Saga, is an action-packed mashup of suspense, military sci-fi, and space opera horror that will keep you guessing every turn of the page. Awesome book! Great story that kept me on the edge of my seat. Twists and turns with exciting action. Interesting and deep characters who seem so real, with life lines weaving the plot and developing subplots. They are people whom I can imagine myself sitting down with to learn about being a Marine or Soldier. Can’t wait for book number Three!